Vines and creepers need a support framework in order to flourish. Simple stakes pinned into the ground can do the trick. But then, you’ll get to support only one or two plants due to the limited support area. Switching to garden trellises makes a good idea for those that want more support area with a decorative touch. Building a garden trellis is a fun home project you can undertake. However, there’s no need to get your hands sore when you can buy one for yourself. Garden trellises aren’t made the same. There is a variation in size, style, and construction material. You don’t want a trellis that will let you down by lasting only a few months of use. So how do you get to know the right garden trellis to purchase? Well, we’ve got a roundup of the best garden trellis that might make a great addition to your garden. This is a durable garden trellis made of maintenance-free PVC vinyl material. That gives a trellis that’s resistant to fading, cracking, and peeling. The trellis stands 76 inches high and spans 28 inches wide. A titanium oxide coating makes it resistant to UV rays for increased durability. The trellis is pre-cut and has pre-drilled holes that makes assembly much easier. 16-inch posts come in handy to let you pin the trellis on the ground. You can choose to use it in a freestanding design or install against a wall. This garden trellis provides more support area for climbing vines and plants. It’s made of weatherproof PVC vinyl coated in titanium oxide. This gives a trellis that can survive the harshest weather conditions. It stands 85 inches high and spans 42 inches wide. The trellis leaves a walkthrough to let you inspect plants with ease. 2 square inch posts are used to construct it. The trellis comes with 16-inch anchors to provide a stable and long lasting installation. This is a plastic trellis made of durable PVC vinyl. The plastic construction gives a tough yet lightweight construction you can handle with ease. It can take a beating from weather elements without developing any signs of cracking, peeling, or fading. This trellis is 64 inches high and 28 inches wide. 16-inch steel anchors help pin it on the ground for added stability. You can hose and wipe clean for easy maintenance. This trellis can be laid against a wall or left in a freestanding design. This is quite an elegant take on a garden trellis. It has decorative finials at the top to give something that will make your garden stand out. The trellis is fabricated from PVC vinyl to ensure maximum protection from harsh weather elements. It gives a tall support of 96 inches and spans 57 inches across. The lightweight 2-by 2-inch posts give a support structure you can handle with ease. This garden trellis is designed to anchor on a wall. Now, this is a true beauty statement with structural integrity to match. This trellis is a decorative piece made of tough iron metal. It gives strong support for most climbing plants. 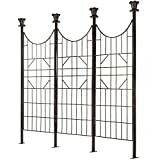 The trellis has finial panels that come in handy to add height and variety to your garden. The iron is powder-coated for improved resistance against rust and weather elements. Thick wires are welded onto the main supports for that elegant architectural appeal. This arched trellis doesn’t need assembly. What you do is just stick into the ground and you’ll be good to go. This garden trellis has a durable powder-coated steel construction to provide strong support and increased resistance to weather elements. 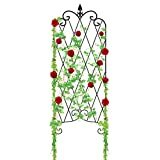 It’s a decorative trellis that will give your garden a lovely touch. The thick welded wires that form this garden trellis add an architectural statement. It stands 60 inches high and 18 inches wide. You can stick this trellis into a planter or choose to use in a freestanding form. It’s a sturdy and functional trellis that doesn’t require any assembly. This garden trellis takes the flowing shape of leaves, stems, and branches of plants. It’s a beauty statement that will add a decorative touch to your garden. 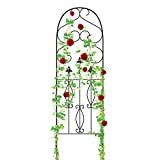 It has an attractive archway that supports climbing plants in style. The trellis is made of strong, welded steel that has a rustic weathered finish. It comes with brackets for easy installation against a wall. The trellis looks great when anchored in a planter. Dura-Trel 11160 is a garden trellis that comes in a grid design. It’s constructed using lightweight PVC vinyl. Despite the lightweight build, this trellis is tough enough to withstand adverse weather conditions. It measures 35 inches wide and stands 65 inches tall. 16-inch anchors pin it into a freestanding design. You can choose to install against a wall. Maintenance is quite a breeze since all you have to do is hose it down and wipe clean.